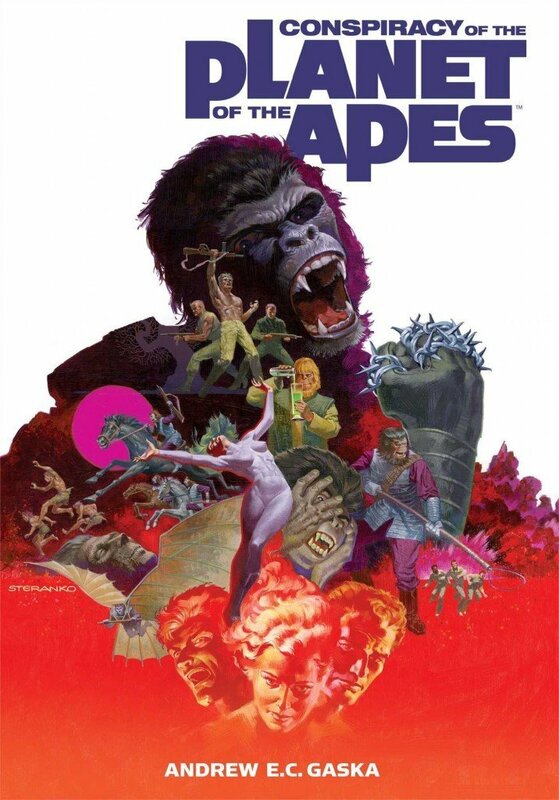 Planet of the Apes – THE BOOKS THAT TIME FORGOT. George Taylor has just found out that he is on Earth after coming on the Statue of Liberty. His journey to the ruins of Manhattan get him separated from his mate Nova. Here he finds a futuristic city with robots run by a hybrid ape/human child. Only this is an illusion by the mutants that control the city. They believe Taylor is a servant of the apes and are determined to find out what he knows about their plans to invade. Through flashbacks we see Taylor’s life including his finding a downed UFO during the Korean war. This lead to him getting into the secret ANSA space program using salvaged alien technology. All this against a surreal alternate history where Goldwater won the presidency and Texas has seceded. Meanwhile in Ape City the old order is falling apart. A fundamentalist orangutan has become the head of the church and allies with General Ursus in his crusade to rid Simia of it’s humans. 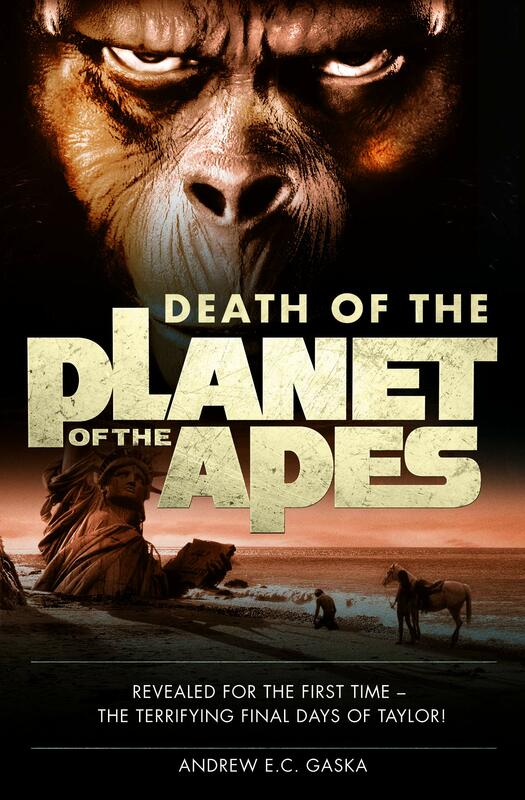 As the army marches into the Forbidden Zone Zira and Cornelius get involved with a chimpanzee revolution and Dr. Milo as he manages to salvage the astronauts spacecraft. Mungwort the garbage ape that was exiled gets involved with hybrid human/ape mutants in the ruins of New York controlled by the giant brains called the Inheritors. All comes to the final confrontation with the mutant’s doomsday bomb god. So this book is the untold story between the first and second movies. Here we get Taylor’s story including his past. We get what happened to Zira and Cornelius. The events that shaped the ape society. How Dr. Milo was able to get the spaceship to work. It has been a while since I read a new book that I looked so forward to reading. This book was just awesome. Gaska is a true fan of the genre. Not only are there meticulous references to the movies but also are included are the astronauts from the TV series and animated series. There is a nod to the various comic book incarnations from both the Boom series and the old Marvel black and white magazine. I even found a reference from the old Adventure series from the nineties. The book is only $6.47 for a new 400 plus page book so this is an excellent deal. 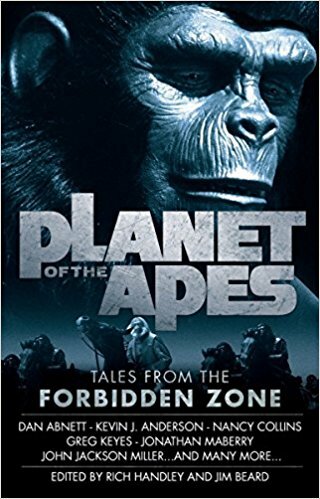 If you are a fan of the apes movies than you will love this book. Three astronauts are launched into space to go to a distant star system. Only the Liberty 1 develops a malfunction and turns the ship around. It crashes in a dead sea and three astronauts Taylor, Landon and Dodge survive. They trek across a wasteland and find a lush valley filled with mute humans. Suddenly gorillas riding horseback and carrying rifles attack. Landon is wounded and taken captive. What he doesn’t know is that the mutants have implanted themselves in his mind. They are using him to spy on the apes. So he is not allowed to talk. A chimpanzee doctor Galen takes him to his laboratory where he conducts experiments on organ transplants. Landon is trapped and has flashbacks of his past. Milo the engineer is the cousin-in-law to Galen and designs tools for him. One day while playing a music box recovered in the Forbidden Zone this breaks the hold the mutants have on Landon. Milo finds out about the marvelous spacecraft and mounts an expedition to retrieve it. Eventually Landon is discovered and given a lobotomy to hide his secret. So in the original movie we know that Landon one of the astronauts fate is a lobotomy. This book tells his story. A fascinating idea to have the mutants use him as their mole in Ape City. This also gives us the story on how Milo found out about the spaceship and how he raised it. A fascinating look at the behind the scenes of Ape City that the movie didn’t show us. Ape society is somewhat a totalitarian one with its own secret police. Apparently ape can’t kill ape but they can disappear ape into the night. Plus there is some light stuff like the fact that Marcus the head of the gorilla secret police’s father was a notorious philanderer named Digby who sired a whole bunch of illegitimate offspring and he is always reminded of this by running into gorillas that look like him. One of these sons is a half-breed gorilla chimpanzee named Murgwart who is the garbage ape and having an affair with Galen’s wife. The only thing I didn’t care for were some of the flashbacks that Landon had about an earlier mission to Jupiter. It was confusing and did nothing to move the plot along. This was an enjoyable and interesting book that shows us more of Ape society. Supplemented with beautiful illustrations from a wide variety of artists. Of course if you watched the movie you know how it ends for Landon. The fun part is getting there. Gaska is scheduled to release Death of the Planet of the Apes this November. It is about Taylor’s time with the mutants and what happened in Ape city between the first two movies. Sounds like an interesting idea and looking forward to it. Oh and I have been doing a lot of Planet of the Apes comics on my other blog. You can check it out here.